The quality of Chatham’s public school district, which serves both the borough and Chatham Township, both in Morris County, is frequently mentioned by new residents and real estate agents as a draw to the area. The centrally located downtown train station, with direct train travel to Midtown Manhattan in less than 60 minutes, is another draw for new residents, many of whom still work in Manhattan, but chose to live in Chatham so they can raise their kids in a more family-friendly area with much more outdoor space than many New York City suburbs. In fact, the lush examples of nature — seen in the town’s many backyards, gardens, and public parks — is noteworthy even by Garden State standards. Because of the walkable downtown and central train station, many New York City transplants may only have one car, but two working parents. For those who like to walk, there is easy access to transportation, shops, the library, restaurants, and more by foot. Family recreation is a priority for Chatham residents. Memorial Park Public Pool is newly renovated and opened seasonally with relatively affordable family rates. Public lacrosse, soccer, field hockey, and baseball fields are often swarmed with activity on the weekends, the air checkered with cheers from parents. A weekly farmers market is held every Saturday from June through Thanksgiving. For gardeners who prefer to grow their own fruits and vegetables, rentable plots are available for a $10-35 annual fee. The Chatham Community Players provides light theatrical fare year-round. The nonprofit, founded in 1922, is a treasured local organization. Also of note is the Library of the Chathams, located at 214 Main Street. Positioned near the fireplace in the main lobby, the New Jersey Room at the Library of the Chathams is definitely worth a visit, as it has become a repository of valuable and irreplaceable books, maps, photos, and yearbooks pertaining to the Garden State. Working with both the Chatham Historical Society and the Chatham Township Historical Society, Library staff have recently collaborated on improving the atmosphere in the room to better preserve endless examples of literature including Murder Along the Musconetcong: A Tale of Jersey Justice by Ruth Trask Farrow. Nostalgia resides at Liberty Drug and Surgical, a downtown pharmacy with an old-fashioned ice cream bar and soda fountain. Also of note, popular Italian restaurant Scalini Fedeli is housed in the 18th century Jacob Morrell House at 63 Main Street. Lastly, note the proliferation of wide front porches outfitted with porch swings and American flags hanging over elegant center-hall Colonial homes (you might even think that you’ve landed in an episode of Mad Men). 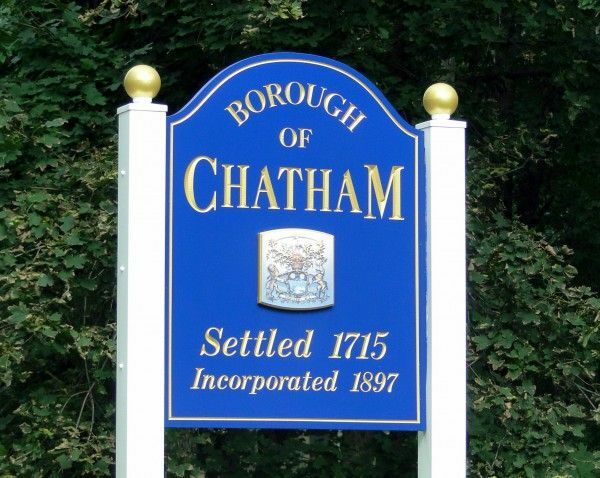 Chatham played a historic role in the Revolutionary War, as it was one of the few towns strategically situated to combat the westward advance of the British. In order to confuse the enemy, Washington called for the construction of baking ovens nearby to give the impression of a permanent encampment. Washington also took up residence at the Morrell House on Main Street, where he was said to have penned more than 17 personalized letters which are still in existence today at The Library of Congress in Washington, D.C. The School District of Chathams includes six schools: three pre-kindergarten through third grade; one for fourth and fifth grades; one middle school; and one high school. Chatham High School consistently ranks as one of the top three public high schools in the state, and New Jersey Monthlyhas frequently chosen it as the No. 1 public high school in the state. Chatham is situated 25 miles northwest of Lower Manhattan. By car, the drive is approximately 45 minutes via Interstate 78 and the Holland Tunnel. Trains run from Chatham to New York Penn Station (the Morristown Line) on the hour at a time of 45 minutes (for an express) to 58 minutes. Trains also run to Hoboken and Newark Airport (PATH service to Manhattan is available in Hoboken). So, with top-ranked public schools and close proximity to Manhattan, Chatham may be a great option for young families searching for a wholesome pace of life, as well as a fun place for people to visit.